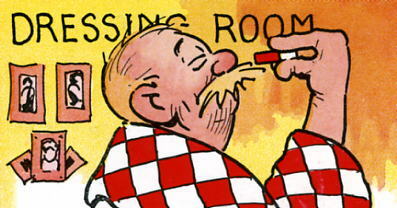 In 1916 Bruce Bairnsfather brought Old Bill to the stage for the first time, in 'Bairnsfatherland,' a scene specially written for the revue Flying Colours at the London Hippodrome. It was the first of many stage incarnations for the famous character, who was portrayed by dozens of famous actors of the day. Click on the links below to find out more about all the theatrical productions written by Bruce Bairnsfather, and a few others which were inspired by his work.